The Force Dimension releases brand new album Sorcery Pigs! 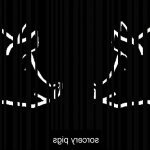 The Dutch Electro-EBM combo The Force Dimension have released a brand new album called Sorcery Pigs which is now available trough the band's bandcamp page! Want this legendary band on your stage! Mail to info(at)bodybeats(dot)be now! More info and media here! New Peek-a-Boo Magazine #30 - Out Now! With free download! Your beloved FREE underground music zine Peek-a-Boo is out there again! 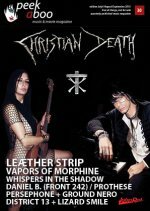 This time with a feature interview with the notorious American Goth Rockers Christian Death! For this special occasion the band decided to treat our readers with two (temporary) free downloads of their song Peek-a-Boo, taken from their Born Again Anit-Christian album (1990). DER HAUPTMANN : (2017) German-Polish-French biographical drama, black & white, directed by Robert Schwentke based on true facts. The stunning voice and frontlady of former Linea Aspera and Keluar returns to BIMFEST 2018 for an exclusive Belgian show with her new electronic solo project Zanias! Zanias was born in Australia, raised in South-East Asia and now resides in Berlin. 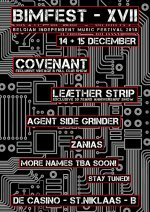 She was once known as the head and voice of bands Linea Aspera and Keluar, and now performs and DJs as a solo artist as Zanias. LEÆTHER STRIP (DK) 30th anniversary show confirmed @ BIMFEST 2018!! !